So, the GIF itself shows Zlatan Ibrahimovic can’t continue use his super human powers to score amazing goals every week, but he will still try. This is honestly amazing and I’m still stunned by the attempt. It’s absurd he’s still this fast and this flexible at 36. I’m 32 and I’d be in traction had I tried it. Zlatan is special and we should be reminding ourselves this every chance we get. I had suspicions Zlatan would a drastic “every chance” shooter, but perhaps not as pronounced as, say, Sebastian Giovinco, and the theory is turning out to be true. His average shot distance is 19.3 yards per shot spread across 19 total shots from open play, ranking him 11th in average shooting distance among strikers who have taken a minimum of 10 shots this season. He’s taking shots, he’s taking them frequently and he’s doing it mostly, if not almost exclusively, from beyond the 18 yard box. One last thing of mention is that this possession sequence starts with Ola Kamara in motion, bringing the ball up from midfield. Most know I’m a big fan of Ola Kamara but one thing I’ve been specifically watching concerning him with his move to the Galaxy is his passing ability, or lack thereof. He had some okay passing moments here and there with Columbus, but for the most part his passing was one of the more underwhelming aspects of his game. Now with the Galaxy they’re asking him to drop further into the midfield and have passing as a bigger part of his game. In fact, his average pass starts at 60th percentile of the field going to goal, while last year it was 65th. This isn’t something which has been specifically noticeable yet and the casual fan is probably oblivious to it. It’s not been a problem yet and it may not ever become a thing. But when you already have below average defenders who late in games are losing their legs and struggling to close down space, the last thing you need is to be pushing one of your less effective passers into the midfield and then ask him to take increasingly risky passes (and he’s doing more of in LA than he was in Columbus). This seems bad to me and Jonathan Dos Santos can’t come back fast enough. I’m not sure if you’ve been following along with us the last month and change but one thing that has certainly been a thing ‘round these parts is these ‘ninji’ kicks. I honestly can’t believe how many occur and it’s so much more than I would have guessed, such as in this failed attempt from Josef Martinez. Overall I love the hustle (stairs menacingly at Atlanta fans) by Martinez to win the ball back after the poor turn just outside the penalty box by Illie Sanchez. It’s then the sweet flip over the defensive backline by Ezquiel Barco to set Martinez free for chance. The only problem really is the weird approach by Martinez to try and scissor the shot. Now, I don’t really understand why he attempted the shot in this manner. It’s odd and to be honest I can’t imagine it is nearly as successful as the equivalent expected goal score shows it to be. Ike Opara has basically no chance at this ball no matter how much he tries which makes the decision to go for the shot like this . What makes this even worse from the Martinez perspective is that Opara wasn’t even ball watching, he gets just plain beat with a quick first step after dishing off to Barco. Matt Besler is caught a bit in no man’s land and you can tell he doesn’t have a good choice on how to act so he chooses to try and fill a passing lane as best as he can. I don’t want to declare this to be an utmost certainty, this is merely an observance and a subjective opinion, but this might be one of the single the best attacking sequences from Vancouver in recent history. Carl Robinson needs to watch this 100 times, three times a day, every day until he’s figured out how to draw this out and teach it for his player's to replicate it. This pass from Marcel de Jong is such an amazing one and for all the crap I generally give him this is a truly great moment. The combination between Efraín Juárez (how good is the Star Juarez banner up in Vancouver??? I love it!) and de Jong is a bit clumsy and yet slick at the same time. 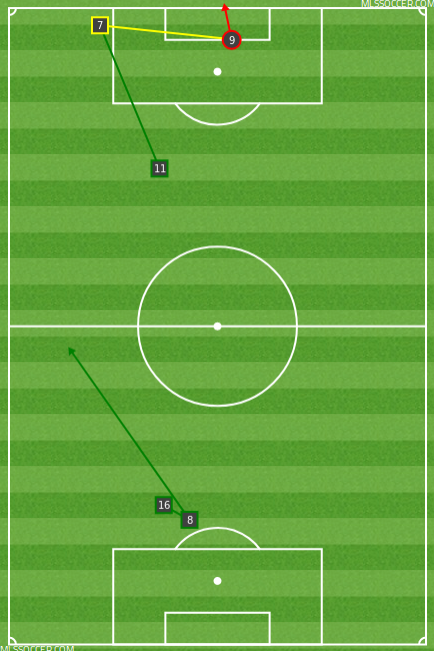 De Jong releases the ball and basically hurls Yordy “Speed ball” Renya forward into Houston’s defensive third. This is basically peak Renya short of him stumbling on the cut back. I like Renya a lot, but the problem during his tenure has been mostly related to health. His average xG+xA over the last 18 months is at 0.52, and narrowing to his specific tactical band of “attacking midfielders” you can see he ranks 11th out of 62 qualified with 1,000 total MLS minutes. Renya represents the first legit “Plan B” to pumping crosses into the box. Don’t misunderstand me, 30% of Renya’s passes inside the attacking third have been crosses and it’s a crime against humanity for it be so high, but with Kamara around this season it’s less of a bad thing. Perhaps this is a small transitioning away from it, in small steps and even if it’s only a slight departure from it is a win I’ll take for ‘good soccer everywhere’. Tosaint Rickets has a very unfortunate situation occur here where he does a great job to win direct space to the ball and creates a great chance in the dying minutes. Unfortunately Seattle keeper Stefen Frei is there to... I don’t know how but deflect it with his knee. Seattle are playing completely compact and yet there is space on the front post, outside the 18 yard box in zone 14 and Ager Aketxe is making an overlapping run which would have gotten him at least into the 18 yard box for a better type of cross. Toronto has the pieces to pull defenders apart and make those runs and to be fair they’d been doing it most of the game against Seattle. Coming back to the play at hand, Jordan Hamilton does a helluva job to redirect the cross back in front of goal to give either Ricketts or Ryan Telfer a chance to get to the ball. Ricketts creates a nice bit of cushion here putting his body between the defender at the ball as he puts the shot on frame but just unluckily in the path of Frei. Last week I used the term “textbook” and “classic” to describe Ola Kamara's approach, and this isn’t any different. I love it. He is on the balls of his feet, slowly positioning himself perfectly between Jimmy Mauer and Maynor Figueroa like some kind of goal scoring predator. My favorite thing is at the 92:05 mark he checks over his shoulder to identify where the defenders are and what space he has when the chance to take the shot comes. It’d be really easy to glance over the pass made by Zlatan, but he makes Matt Hedges look foolish with such a simple ball roll. He moves him exactly the way he wants and creates just enough space to slip the pass into Ashley Cole, who makes a stellar run. The one redeeming thing here from the Dallas perspective is Anton Nedyalkov. I love how he first tries to hand off Romain Alessandrini to Jacori Hayes and then switches to Kamara, then after the shot he comes back and scolds Hayes for neither rotating nor covering Alessindrini or the back post. Nedyalkov doesn’t directly influence the shot by Kamara after picking him up, but really he limits the goalmouth available. Kamara doesn’t have the ability to turn on the pass and instead, knowing his environment, takes the one touch shot back at Maurer. Normally he’d just punch it over Maurer’s head and celebrate, but he just doesn’t get a good touch on the ball and instead drives it low which creates the easy save. As fans, a lot of us see something as “laid on a golden platter” for him instead of all the work and effort taking place to give them a really good chance to level the game state. Driving the ball low rather than smashing it up and over the keeper is the one subtle difference here between losing all points and scrounging a tough road draw. This press by New England is flustering, already in a positive game state and they’re pushing up so high. Alex Bono makes a (terrifying) dribble in an attempt to alleviate some of the defensive pressure. It’s actually not bad and he probably got a nice text from Nick Rimando... or he would have had Ager Aketxe not made the pass to Cristian Penilla with Bono so out of position. This is such a Thursday night pick up game thing to have happen. Most of the time I can look at a chalkboard and kind of envision what happened. Here I thought: “Man, Penilla probably is all over the defender, earns a recovery and really does a heck of job turning on the opportunity and firing it quick to surprise Bono.” I suppose the thought is partially true. The shot is taken just about as soon as he receives the ball from Aketxe. But Toronto had finally created space and looked to be breaking free from the press only to turn it over to the one New England guy who had been standing around for the past 15 seconds. What makes this goal all the more tough to swallow is Penilla’s shot really, in all honesty, was garbage. It’s super disappointing Bono couldn’t find enough of the ball to turn it away after his run back to the net. No doubt he was out of position but in rewatching everything, it seemed like he was close enough to at least derail the shot. I guess this is just Toronto’s life now... or, again? Yeah, whatever it is, it’s not good. Two things; first, it’s good to see three of the top five shots above are mentioned here. Second as kind of an awkward shout out to what I wrote about yesterday with Kendall Waston, you’ll see he ranks 10th this week in xG accumulation. He’s a really fascinating piece for Vancouver and I think it furthers the idea that teams should be doing more, in general, with their dead ball opportunities.